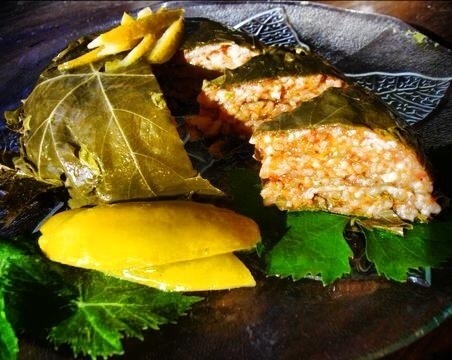 Vine leaves with herbed rice by Cecile Yazbek. 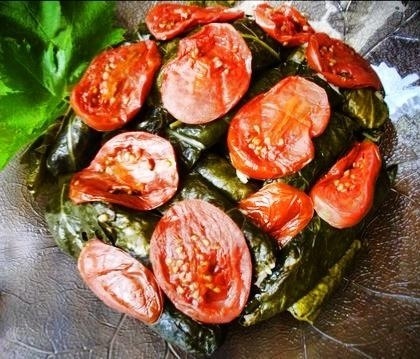 ” Vine leaves stuffed with rice and herbs (dolmades in Greece), are a sign that one is eating the food of eastern Mediterranean. Tender leaves should be harvested before sun and wind had done their damage. In South Africa, my mother once fooled a guest at the table and told him they were caterpillars, the big fat ones that hide in the grape vine”. 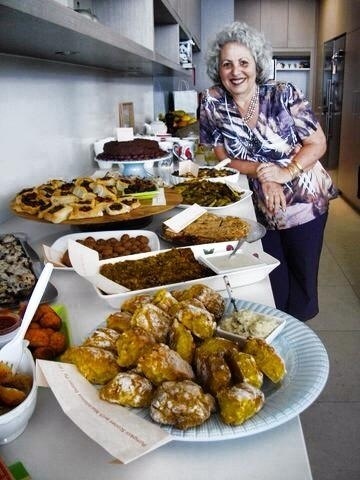 This is Cecile’s introduction of this traditional eastern Mediterranean dish. She has also created a vine leaves roulade for those of us who have no time to roll. The filling can be used for vine, kale or spinach leaves. If using brined vine leaves, soak in cold water for a few hours to reduce saltiness. 250 g vine leaves, blanched in hot water for a minute or two before rolling. Mix all ingredients for filling. Spread leaves, underside up, and place a small amount of filling in the centre, at the stalk end. Begin rolling, folding the edges closed. Place a few leaves in the bottom of the saucepan and pack the rolled leaves closely together. Cover with few more leaves and a little oil. Put a plate on top and add enough water to cover. Bring to the boil and simmer for 45 minutes until the liquid is mostly absorbed. Allow to stand and cool. Unpack into a serving bowl, adding more lemon and oil if desired. Tags: books, cleaneating, food, gluten free, healthy, inspiration, Lebanese, Mediterranean dishes, publications, recipes, vegan, vegetarian. Bookmark the permalink. i’d love to make this, but where does one get vine leaves in sydney? Dalia, you can find fresh vine leaves in summer at fruit shops in suburbs where there are large Arabic speaking communities, and vine leaves in brine in Middle Eastern grocery stores. Looks amazing, thank you for sharing. Oh I absolute love these, what’s not to love!? Your post so appetizing! 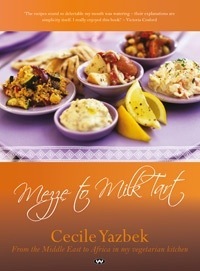 Great to hear, I have Cecile’s book and it’s full of delicious recipes. Thank you for commenting.